The second solo release from the guitarist of Electrum finds him in much more prog territory, as contrasted with the elegant prog-inflected fusion of his first outing. The epic "A Poet's Talespin" with its beautiful piano lines and wonderful female vocals recalls the best of contemporary progressive rock. Clocking in at just under 30 mins it is the epitomy of prog. The remaining four tracks range in length from the brief closer "Counted the Stars" at a minute and eighteen seconds to the nine & a helf minute opener "Skating on Europa". 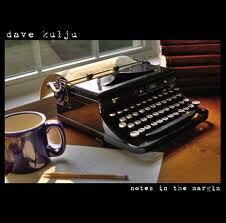 Kulju's guitarwork recalls many of the greats from Jeff Beck to Roine Stolt without ever becoming just another copyist! And he proves that he is more than adequate on the keyboards as he contributes tasteful piano and synthesizer parts throughout. Dave plays everything himself except for the drums which are played by Frank Basile (www.livestudiodrums.com). And he is joined on "A Poet's Talespin" by vocalist Annie Oya (www.voxinabox.com) and on "Know Again" by violinist Ian Cameron (www.efiddler.com)This CD is a pure joy from beginning to end and a welcome addition to any prog fan's shelf. Highest recommendation!